Giant Jupiter is a source of odd radio noises. Now anyone can listen to them using a NASA-sponsored audio stream on the Internet. February 20, 2004: Waves crashing on a beach. Woodpeckers peck-peck pecking. Whales calling plaintively across the sea. These are the sounds of Jupiter. There are no whales or woodpeckers on Jupiter. There are no beaches. But Jupiter beams these sounds to Earth anyway. They emerge from the loudspeakers of short-wave radios during Jupiter's occasional, intense radio storms, caused by natural radio lasers near the planet's magnetic poles. Right: Jupiter and three of its moons, photographed Feb. 7th by amateur astronomer Gary Palmer of Los Angeles. He used an 11" telescope and a digital camera. 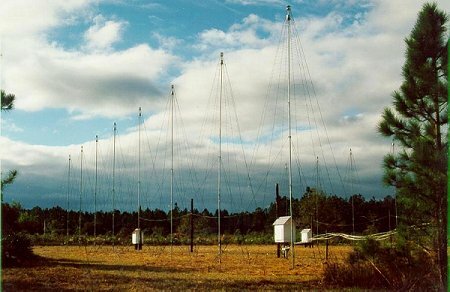 Many ham radio operators have heard these storms, late at night when Jupiter is high in the sky. Now you can listen, too, online, thanks to a live audio link to the University of Florida Radio Observatory, supported by NASA. Not far from the meandering Suwannee River in central Florida, there is an array of odd-looking antennas: spiral "tee-pees" and gangly "Yagis." Every night these are trained on Jupiter, monitoring the planet for radio outbursts in the frequency range 18 to 32 MHz. Sensitive receivers translate Jupiter's radio waves to audio sounds. During a strong storm, the observatory's control room echoes with pecks, pops, and crackling swooshes.
. In addition to genuine Jupiter sounds (samples), you might hear human voices and music from terrestrial radio stations. Try listening for Jupiter on Feb. 22 (midnight - 2 a.m. EST); Feb. 23 (2 a.m. - 4 a.m. EST); and Mar. 1 (3 a.m. - 4 a.m. EST). Those are the dates of some expected storms. Visit SpaceWeather.com for a more complete calendar. The lasers are powered, in part, by Jupiter's moon Io. Volcanoes on Io hurl electrically conducting gas into Jupiter's magnetosphere (the region of space controlled by Jupiter's magnetic field), where it collects in a doughnut-shaped region, the "Io torus." As Io travels around Jupiter, it plows through the torus and makes waves, like the wake of a boat. These "Alfven waves," guided by magnetic forces, carry about 40 trillion watts of power to Jupiter's polar regions--more than enough to fuel the radio storms. Jupiter's Io-controlled radio emissions don't go in all directions. The radio laser beam has the shape of a wide hollow cone. If Earth is inside the cone, we hear nothing. If Earth is outside the cone, we also hear nothing. But if Earth is in the narrow edge of the cone, we can hear some strong radio bursts. Jupiter rotates once every 10 hours and the cone rotates with it like a lighthouse beam. To catch a radio storm you have to know (1) when Earth will be aligned with the edge of the cone and (2) when Io is in the right position to pour electrical energy into the storm zone. This will happen a few times in the weeks ahead, e.g., on Feb. 22, Feb. 23, and March 1. When you tune in, don't expect to hear a constant stream of pecking and swooshing. Jupiter's radio source is intermittent. You might hear nothing but static for an hour. Then, just when you're ready to give up, the storm will surge: rapid-fire pecks, loud and insistent, wave-like swooshes, gently undulating. It might last for a few minutes, or a few seconds. No two Jupiter storms are alike, and that's what makes listening fun. Jupiter's magnetosphere is huge. It's about 10 times wider than the sun, and its tail, stretched out by the solar wind, extends far beyond Saturn. One day, astronomers expect, this vast magnetosphere is going to flip. The Sun's magnetic field reverses polarity every 11 years; Earth's magnetic field flips, too, every 300,000 years on average. This seems to be normal behavior for magnetic dynamos in stars and planets. When will Jupiter's field flip? Listening online is not the only way to tune into Jupiter. NASA also supports an education program for kids (young and old) called Radio JOVE. Join, and you can buy a radio telescope kit, build your own observatory, and start listening from your own back yard or school yard. Peck-peck. Pop. Swoosh. This is too much fun for professionals alone.